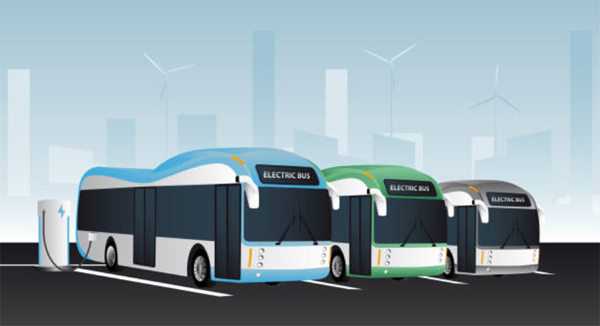 Could electric buses end Bermuda’s transportation woes? Jeff Sousa believes E-buses are better than diesel. So much so, he and Sousa’s Landscape Management vice president Mohammed Farooqui made a presentation with Aideen Ratterray Pryse, the permanent secretary for the Ministry of Transport & Regulatory Affairs to discuss the idea of replacing Bermuda’s diesel bus fleet with one that would eventually be all electric. Mr Farooqui went to China to see E-Buses in operation. In December 2017, the city of Shenzhen completed its transformation to an all-electric bus fleet and now has 16,359 of the vehicles on the road and will soon be transitioning its taxi fleet, nearly 17,000 of them, to be all-electric vehicles as well. Mr Farooqui said he read our current diesel buses costs close to $500,000. That would allow Bermuda to replace its ageing bus fleet quicker as more buses could be purchased. Also, Mr Farooqui said Bermuda’s roads could have a magnetic strip underneath them, which would allow for nearly constant charging of the E-Busses. He said this technology is standard in Asia, especially China and Japan. If Bermuda didn’t do that option, because of its ideal size, there would only need to be three charging stations — Hamilton, Dockyard, and St. George. Mr Farooqui said the lifespan of the buses is the same, but they break down less because there is no engine and attached components to have problems. He added, like Bermuda’s current fleet, the E-buses can be customised for the size of Bermuda. Mr Sousa said, “As we put in the proposal to the permanent secretary of transportation we’re only looking at making a fair percentage – I’m talking about a small percentage, less than 10 per cent. We’re not looking at fleecing the public. Also, Mr Sousa said there were other costs savings to be had through the elimination of the use of diesel fuel, reduced operating costs, fewer mechanical parts and higher efficiency. “I want the Bermuda public to watch the video with a clear, open mind and how fantastic this would be for Bermuda without putting any prejudice in with the concept. I’m all for more electric vehicles but, there is a big but …. can Belco handle the extra load? Belco should be totally fine as the majority of charging can be done at night when the load is at its lowest. Depending on the “quality” and provided the capacity of the batteries is spec’d right the “usable” lifespan should be good, 8 years perhaps even more. Once they are done then can be repurposed for energy storage on the grid for another 10 or more years before finally needing to be sent away for recycling. The challenge is what quality are these buses from China regarding components and batteries? Will they hold up in our climate, that will be the ultimate test. Offset maybe by the many , many hundreds of empty houses , apartments and office blocks ? This is not fair, what happened to waiting until the govt procurement notice came out and you get in line with everyone else. I hope the Govt don’t get hoodwinked by this! Government can order the buses on their own behalf, just like they do now. No need for them to get someone to procure them. The technology is not there yet for these to be cost effective. It will get there however it is not there yet. It has to be a good idea – cleaner, easier to maintain, less parts to break etc but …. can Belco handle the extra load as more and more electric vehicles come to the Island? A small percentage could possibly be recharged by solar energy. Just my layperson postulation. Great options but Waste Management needs to be involved in the discussion. Can Belco handle the load AND can Bermuda manage the waste of the batteries. In other words what is the cost and carbon footprint of an electric from cradle to grave. Bermuda has to find a suitable site for battery disposaland ship its waste off island (net positive). China’s economy thrives from manufacturing and has facilities that would pay a nominal fee to take the batteries and recycle them (net negative). There are also opportunities to go away from custom-made buses and purchase smaller stock vehicles. Great idea – it will be interesting to see if Bermuda has the infrastructure and maturity to go beyond our currently vested financial interests to do what is best for Bermuda and already happening around the world. It would be great to see an open and transparent bidding process in Bermuda around electricity generation and the opportunities to participate in our emerging eco-economy. Put a bunch of solar panels on the roof of the bus depot or feed directly off of the incinerator and you’ll have nearly free energy once the RoI has been reached. Good long-term strategy right there. The buses in China run in cities that are flat. Oh yes of course. China is entirely flat, with no hills. Lucky you’re here isn’t it. main question is : is BELCO able to handle that extra load ?????? Dont confuse the minister anymore! The bus mechanics aren’t qualified to deal with the complexity of the buses already here, wait until they have to maintain something like these. The bus mechanics struggle with a Briggs and Stratton mower engine…..hahaha. Is the Red, Black, Blue, White or Green wire positive ?????? I really like the idea of electric buses on all fronts. However IMO one or two electric busses should be tested on our roads during the super hot summer months and see how they do. Test them first before we buy them by the bushel. A look none of us have a say! This government makes decisions based on what they believe is right ! Not what the people think so hold your comments and let them do us! I’m voting for dune buggies next ! If Government gets electric Buses I will invest heavily in BELco.